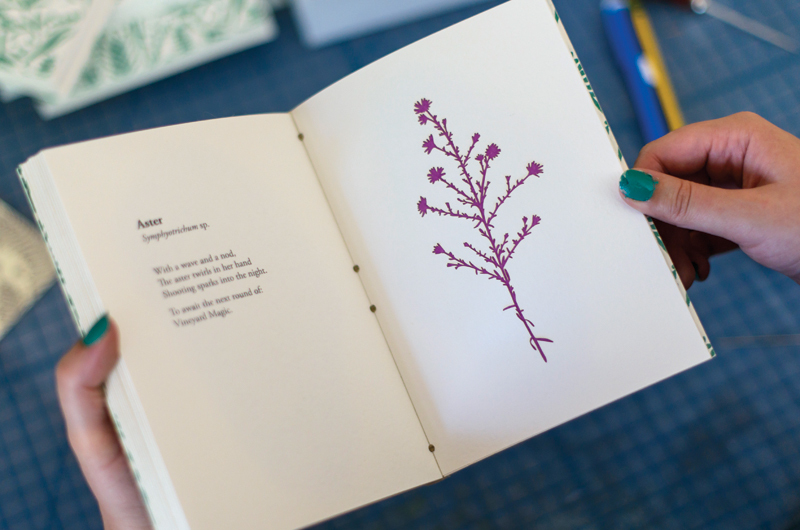 Taylor Stone’s first collection of poems and illustrations, Vineyard Magic, is a hand-bound Valentine to native plants of the Island. The author and illustrator, herself an Island native, graduated from the Martha’s Vineyard Regional High School in 2009. After attending the Savannah College of Art and Design, from which she graduated in 2013, she made her way home, where she was pleased to rediscover the Vineyard with new eyes. Like many creative processes, the smallest measure of light and water can nourish the seed of curiosity, which is how the casual ’zine grew into a full-fledged artist’s book. The tipping point came when Stone enlisted Erin Hepfner of Polly Hill Arboretum to help identify the plants. “Petal and leaf counts led me to devoting considerably more time to the science of it,” she said. With additional assistance from Sandy Bernat of Sea Stone Papers, Tisbury Printer, Boston Lasers, and, last but not least, the editing eye of her own mother, Lori Stone, the project ultimately took on an alchemy of its own. In the twenty-eight pages of the finished book, whimsical words and hints of secret worlds are contrasted with the more classic botanical silhouette of blooms. Sketched by hand on the computer and then used as patterns for laser die-cutting, Stone adds color to the illustrations by securing high-quality artist’s paper behind each die-cut silhouette or window. Finally, this paper bouquet of poems and images is gathered and bound using a traditional Japanese bookbinding technique. “I thought it would be a fun winter project,” she said with a laugh. The process spilled over into spring and early summer, in part because the flowers incorporated into the handmade paper she used to both embellish and reinforce the spine had not yet bloomed. A gentle reminder that nature, like magic, reveals itself over time. So too, perhaps, the new best flora friends (BFFs) found in Vineyard Magic. When the last of summer and fall’s petals give way to winter’s quiet, tuck in, book in hand, and re-relish hidden moments between creator and reader. Understanding, of course, Stone has created a new perennial favorite. Vineyard Magic, limited edition of 150, is available at taylorstoneillustration.com for $110.